Think Jennifer Lawrence falling on her face, Warren Beatty announcing La La Land as (the wrong) best picture, and Robert Opel streaking across the stage. Mix in glamorous outfits, cinematic achievements, star-studded selfies, live Tweets, and awkward mistakes, and you’ve got yourself a winning combination for the Hollywood event of the year—the Oscars. With films like Bohemian Rhapsody, Black Panther, and A Star is Born on the table, it’s anyone’s guess who will win. 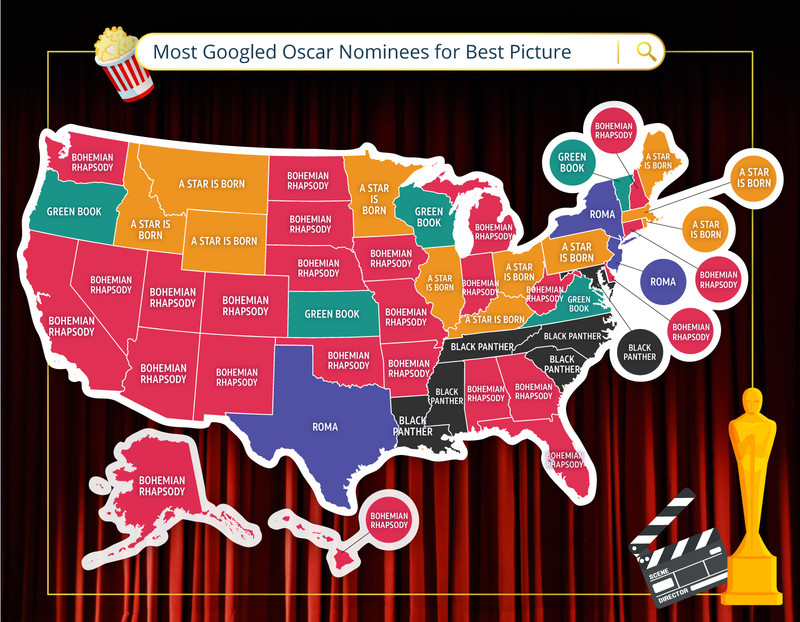 With the help of Google Trends, the team at USDirect determined each state’s favorite best picture nominee to see if there’s a clear favorite across the nation. Do you agree with your state’s pick? Check the map below to see if your state shares your impeccable taste in film and watch who wins live with DIRECTV. Bohemian Rhapsody is the most-searched movie in 50% of the United States. Interestingly, 3 of the 4 top-searched films are about musicians—Black Panther is the only exception. Roma was Googled most in New Jersey, New York, and Texas—all states with high Latinx populations. 5 of the 8 films nominated this year share themes of facing racism and segregation, and empowering people who have historically been oppressed. Even though the majority of Green Book takes place in the South, Alabama, Arkansas, Georgia, Mississippi, and the Carolinas searched the most for Black Panther. Vice, BlacKkKlansman, and The Favourite didn’t appear as most-searched in any of the states. Black Panther is the biggest box-office hit of all the nominees, raking in more than $700 million. It’s also the first superhero movie to get a Best Picture nomination. Data analysts at USDIRECT.com used Googled Trends to learn which states were Googling which Oscar-nominated films the most. The search queries analyzed were based on the official release list of Oscar nominees on January 22, 2019. About USDIRECT: USDIRECT.com is an authorized DIRECTV dealer. All content is the property of USDIRECT.com.